Have you ever had the craving of both a pizza…and a motorcycle ride? I sure have. I try to use my motorcycle whenever I can, and a pizza run is no exception. More so considering that I’d feel guilty spending extra gas money on fetching junk food in a car. If you’ve ever wanted to comfortably carry pizza on a sport bike, check out this universal insulated pizza bag. And no. Balancing it on the gas tank between your elbows doesn’t count as comfortable. Okay, so first is first. Since I imagine most of the people who clicked on this just want to see pictures, here you go. The bag quickly attaches (and detaches) from the rear set with two bungees and a quick-release buckle. It’s designed to ride a bit forward so you feel it pushing lightly on your back. Just to give you confidence that it’s not moving and is secure. 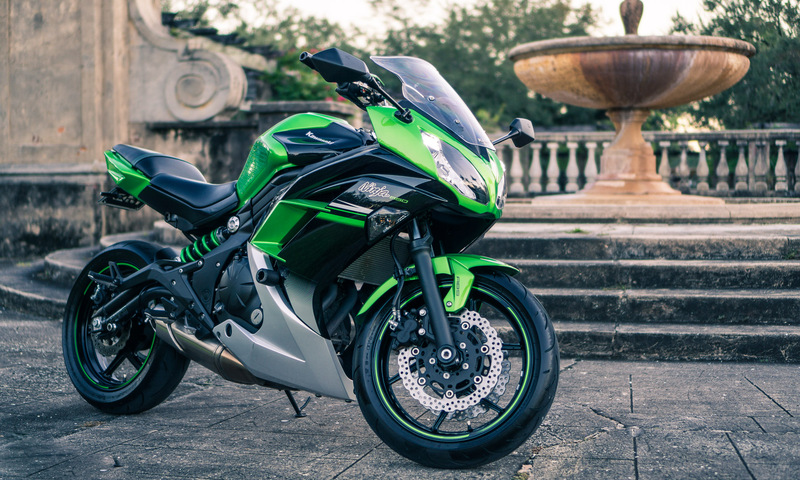 In the pictures it’s installed on a 2015 Kawasaki Ninja 300 sport bike. The insulated pizza bag installs in minutes, and will fit just about any other motorcycle with a flat rear seat just as easily. Also, this is just one of my projects for this bike. If you want to see other interesting upgrades I’ve installed, take a peek at my EX300 Modifications List. There you’ll see all the odd-ball parts I’ve installed on to this bike over the years. The majority are projects a lot simpler than this, and take no time to bolt on to the Ninja 300. You might find something you like. Now that that’s out-of-the-way, let me give anyone interested some detail. Step 4 – Start sewing! Step 8 – And voila! 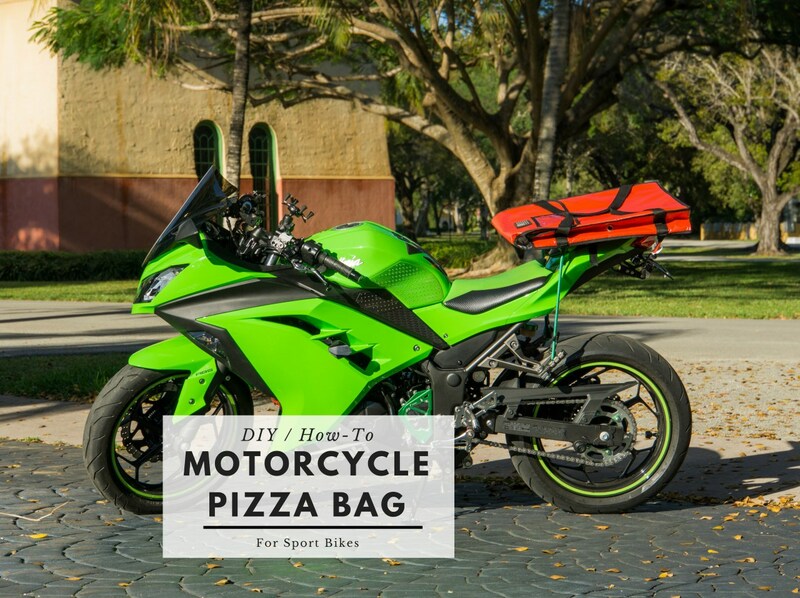 You’ve got a motorcycle pizza bag! But, how useful is it? Apparently, there isn’t really any easy way to carry a pizza on a motorcycle. This is true in general, but it is even worse on a sport bike. Who would’ve guessed. After looking for a solution on Google for the past year or two, I had almost given up. There just wasn’t any reasonable commercially available solution for it. At least nothing you could put on or take off in a minute or two, and certainly nothing that didn’t look ridiculous, too big, or too expensive. I’m not exactly sure what made me think this would work. One day I simply bought an insulated pizza bag thinking I might just be able to mod it to work. For about twenty bucks shipped, it wasn’t expensive if the project didn’t work out. Plus I’d still have a pizza bag. It sounded like a pretty good bet either way. As I later found out, with a bit of creativity, a jig saw and a sewing machine it wasn’t that complicated of a project. The project took a weekend of maybe 5 or 6 hours of actual work. Most of the time it was just deciding what to do, or letting the wood sealer dry. As the pictures show, the outcome was awesome. The insulated pizza delivery bag looks kinda huge, but that’s because it’s made to fit two extra-large 20″ pizzas. You can also use a smaller pizza bag if you want. 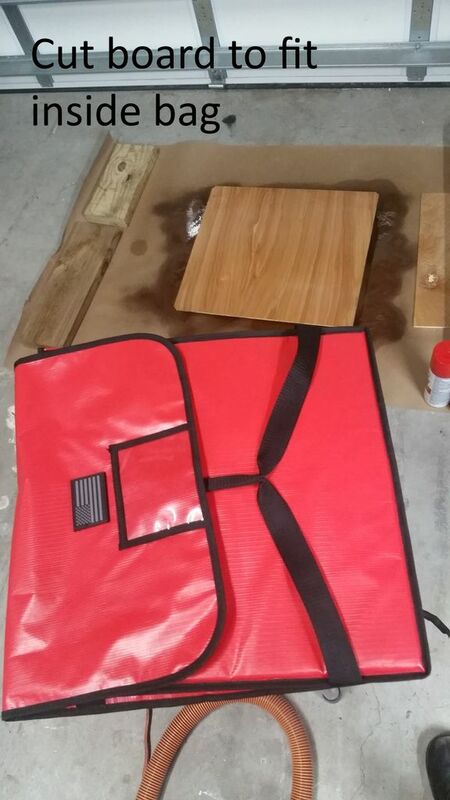 The bag I decided to use was this one – New Star 50110 Insulated Pizza Delivery Bag, 22 by 22 by 5-Inch, Red. Regrettably I didn’t take complete, step-by-step DIY style pictures at the time of construction. But regardless it shouldn’t be too hard for anyone with some basic DIY skills to follow this tutorial. Insulated Pizza Bag – More details on this item below. 5mm Wood Board – I used this underlayment wood (5.0 mm x 2 ft x 4 ft). It’s surprisingly lightweight and pretty rigid. For the price it’s perfect. And it’s probably more than twice as big as you need. Just in case you make any mistakes and have to cut again. 2x Adjustable 48″ Bungee Cords – These will be used to keep the insulated pizza bag attached to the motorbike. One cool feature is that they are adjustable. 1″ Strap (webbing) – Either Nylon, Polyester or Propylene would be suitable depending on the desired color, price, and preferences. 1″ Buckle – Make sure it’s the type that keeps the strap from slipping on at least one side (like most backpacks have). That way it keeps the strap at the proper length. Black, Silver & Red Thread – To sew the pizza bag back up without changing the thread’s aesthetics. Needle for hand sewing – For taking care of some minor details. Tailor’s Chalk – To mark where we’ll be sewing. Wood Sealer (Optional) – This will help with the wood’s longevity. Router with rounding bit (Optional) – To keep the wood’s edges from damaging the bag, I rounded them off with a wood router. Jig saw or any other suitable saw – This will be used to cut the wood. Seam ripper – A seam ripper is used to open the seams on the insulated pizza bag without damaging the fabric. That way we can discretely sew it up again later. Sewing Machine or SpeedyStitcher – When it comes to sewing, a decent sewing machine makes this project a lot easier. I personally recommend the Singer 9960. But the one you or your mother already have abandoned in the closet should work well-enough. If not, the sewing can be done by hand or with a SpeedyStitcher on the thicker parts. Regarding the pizza carrier, the bag I used is this New Star 50110 Insulated Pizza Delivery Bag. Even in hindsight it looks like the best bag for the money, mostly because of the reflective interior which keeps the pizza hot without adding weight or bulk. If you see another bag you like more, or in another color or size, it should serve just about the same. I doubt there is a big difference between most budget bags. By the way, none of the cheap pizza bags seem to be rigid on their own, or have insulation on the sides or the flap. All of them seem to have insulation on the top and bottom (including this one), vents, and are mostly water-resistant, but that’s about it. Here the wood has already been cut to size, and the sprayable wood sealer is drying. I only took a bad pic of this step since at this point I had no idea if the project would actually turn out okay. Here you can see the board after cutting with the sealer drying. To start, measure your bag and cut the wood to size. A Jig saw is probably ideal, but either a circular saw or hand saw would work, too. If anything, oversize it and trim as necessary. Also, snip off a bit from the corners so they don’t poke through the bags material (look at the corners in the picture). I personally used a router to round off the edge that would face down, so it wouldn’t damage the bag. Or at least so the board’s otherwise sharp edges would be less noticeable. It was worth the extra effort, but if you don’t have access to a router it probably isn’t necessary. Another option is just breaking the edge with a cheap wood file. Finally, I applied a sealer to the wood. I imagine the wood might eventually get wet if I clean the insulated pizza bag. Or take on odors, or whatever. Sealing the wood is probably not necessary either, but for the price you can do it and have extra sealer for any other project. Nothing like motorcycles, patriotism and pizza. While I was deciding what the I was gonna do, I removed the ugly “Food…” something or other branding badge the bag came with. It doesn’t appear in the item listing, but mine came with it. 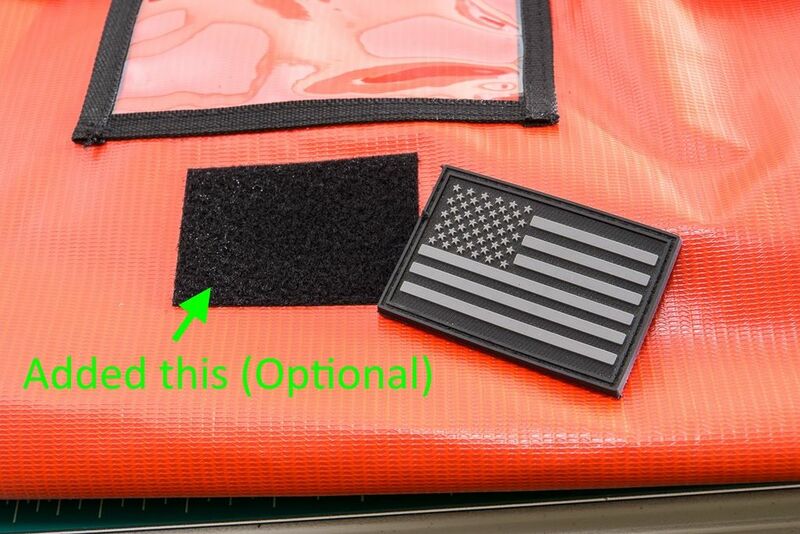 Instead, I attached some Velcro so I could put on a USA flag badge I had lying around, or whatever else I felt like. Nothing like patriotism, motorcycles and pizza. Put some thread in the sewing machine (or thread your hand-sewing needle). The color will depend on the bag and method used. Use the smallest needle you can get away with to avoid damaging the bag. Draw a straight line with tailor’s chalk or a pencil a centimeter or so in front of the bottom foam with a straight edge. This line will mark the sewing line so the foam or board doesn’t move forward into the flap during use. It’s easier and looks better with a sewing machine, but it can be done by hand if needed. Just sew a straight stitch with thread matching the color of your bag. If using a sewing machine, use a smaller needle (70 or so, to not damage the material) with different top and bottom thread to match the color of each side of the bag. Use a longer stitch length (3-4mm) so you don’t weaken the material. That way the stitch is virtually unnoticeable. You might need a roller foot if the material sticks to the regular foot. Rip open the bottom-rear seam using the seam ripper. Carefully. There are two different stitches you’re going to have to open. Do it without damaging the material since you’ll be using the same holes later on. After that, install the wood board. If you rounded off the edges, insert the board with the rounded side edges down. Then seal the bottom side of the bag up again. It’s best to do this by hand using the same holes the original stitches went through to not further damage the material. Now you have to reattach the black “edge” of the bag. With a sewing machine, managing the rigid, large bag can be a pain. But it’s doable. You can also do it by hand if necessary or if you want. Now the bag stays rigid on its own. That’s pretty much the most important step. It’s the main feature needed to be able to use the insulated pizza bag on top of the small rear seat of a sport bike. Make sure you tuck in enough webbing to make sure the rows of stitches catch it. I made two rows of stitches for reinforcement. If you’re using a sewing machine, raise the upper thread tension. I wish I could say the worst is over, but adding the loops was the largest hassle for me. These loops are what the bungee cords will be pulling on to attach it to your motorcycle. You have to sew through 3 or 4 layers of the bag’s material, plus 4 or so layers of webbing if I remember right. It’s time-consuming to do by hand, and on a consumer sewing machine it jams every few tries. How easy or hard this is depends more on you and how you’re doing it. I used a Brother CS-6000i, which is a great budget sewing machine but simply isn’t designed for heavy-duty materials. Basically you have to rip the seams on the bottom side of the bag in the four places where the carry straps are. You only have to rip enough to “tuck” in the webbing on both the top and bottom to make the loops you can see in the pictures. Then just sew it up again, and reinforce it well – I did two rows of stitches. That way the previous stitch you cut doesn’t come loose, nor do the elastic cords pulling on the bag damage anything. It doesn’t have to look pretty. Just as a note, I placed the loops for the bungee cords where the original strap reinforcements were in order to make the attachment points as strong as possible. You may want to place the loops somewhere else if the attachment points for your motorcycle make a different position more suitable. Make sure your buckle fixes the strap length on at least one side. Simply loop it through the bottom. No need to sew it to the bag. The purpose of this is to keep the bag attached to the bike if the bungee cords fail. If the bungee cords fail with this strap, the pizza carrier bag will just bounce around the rear seat. But at least the bag will not fall off the bike and shouldn’t get damaged either (hopefully). The strap’s total length is probably somewhere around 25-30″. The correct length will depend on the width of your rear seat and its design. Just overestimate the number and cut if it ever turns into a problem. If you don’t know how to make straps or install quick releases, there are plenty of videos on YouTube or other online tutorials. It’s probably the easiest part of the project. Once that’s done, the bag’s mods are finished! Now you have a working insulated pizza bag for motorcycles! Give it a try, make sure it works properly. And modify if necessary. Since everything is adjustable this should work on most bikes with a rear seat. All you have to do is slip the bottom strap under the seat, and install the seat with the pizza bag on top. Then you just clip on the elastic bungee cords. It takes a minute or two at most, and removing the bag is even quicker. While riding it feels rock solid. After a few minutes of riding I had no feeling whatsoever that it was going to fall off. I purposely made it so it slides a bit forward. That way it constantly applies light pressure on your back so you know it’s there and hasn’t moved. It stays centered almost perfectly in use. Even if the elastic cords were to fail, the pizza bag wouldn’t fall off thanks to the redundant bottom strap. It would simply tilt the bag and the pizza would get messy. But besides that it wouldn’t be anything tragic. Functionality-wise, I’m surprised with how well it works given how little insulation the bag had. The bag has a reflective silver material all around, and foam insulation on the top and bottom. There are also vents on the side so the pizza doesn’t get too humid. When I tried it the first time, I was pretty impressed with the fact that the pizza was too hot to eat when I pulled it out of the bag. I’ve never had that happen before with a cheap 5$ Little Caesars Hot N’ Ready! The project was definitely worth it. This project isn’t for everyone. But if you ride a motorcycle, have basic sewing skills, and think it’s a cool project, it might be worth your time. This insulated pizza bag for motorcycles was an interesting solution to an interesting problem. Even if people don’t copy it, I’m sure a lot of people wish there was a bag like this available commercially. Anyway, if nothing else I hope you guys found this useful. Ride safe!